Took the Milwaukee North Line to Grayslake yesterday to see how the work on the track replacement between Grayslake and Fox Lake was proceeding. There was the usual Metra MOW equipment and trucks parked around the station, they happened to be working on the northbound track this day. According to the construction schedule, they should be finished this weekend. Photographed a Metra caboose while there, along with Metra switcher 6. 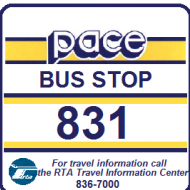 Also photographged the replacement bus service being operated by Pace between Grayslaks and Fox Lake. The two buses being used were out of Northwest. Surprised they were not out of Waukegan. The two buses being used were out of Northwest. Surprised they were not out of Waukegan. If they really needed to use small buses, N doesn't have any. Last time I saw the caboose it didn't have the red and white striping near the top. I was surprised about the small buses as well, but since it is a weekday, could it be because NW has more buses available for midday service than N? Would be the case if the track cut extends past 3:00 p.m.